The Messenger of Allah (Sallallaahu Alaihi WaSallam) said: “There are five prayers that Allah obligated the slaves to perform. Whoever performs them properly without belittling their obligation, Allah promised to admit him into Paradise. Whoever leaves them out does not have a promise from Allah to have Paradise without torture before. If He willed, He tortures him, and if He willed, He forgives him” – Narrated by Ahmad in his Musnad. As such, it is obligatory to perform each of these five prayers in its due time. It is better to perform each prayer early in its time. The true dawn begins when we see light spread at the horizon in the East. When the true dawn appears the Fajr prayer time has begun and this prayer time remains until the first glimpse of the disk of the sun appears on the Eastern horizon. Its time begins when the sun has declined westward from the middle of the sky (zenith). The time remains until the length of the shadow of an object becomes equal to that of the object per Se, in addition to the length of the shadow of that object when the sun was at its zenith. For example, if the length of your shadow when the sun is at its zenith is 5 feet and you are 6feet high, then once your shadow becomes 11feet long the Dhuhr prayer time ends. As soon as the Dhuhr prayer time ends the Asr prayer time starts. Its time remains until sunset. After the entire disk of the sun has set, then the Maghrib prayer time begins. This prayer time lasts until the redness has disappeared in the western horizon. As soon as the Maghrib prayer time is finished the Isha’ prayer time begins. You can be certain that this prayer time is in when you can see many small stars in the sky on a clear night. This prayer time lasts until the true dawn appears. 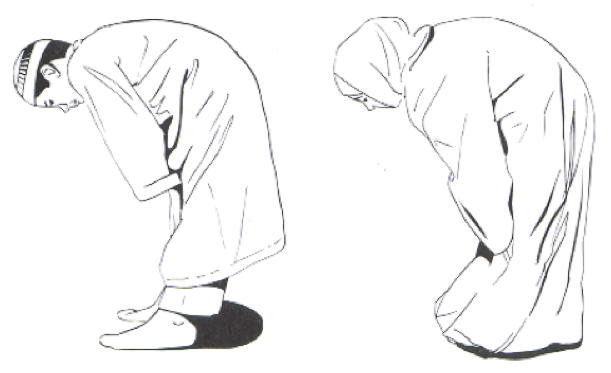 Before a person starts to pray he should place something a short distance in front of him of the place where he prostrates (does Sajdah). Such an object is called SUTRA and isused when the person is praying alone. A person passing in front of the person in prayer, should pass on the outside of the sutra. If someone is praying in congregation, then the imam acts as the sutra. The imam, however, must have his own individual sutra in front of him. Wherever a person is in the world, he should face towards the Ka’bah when he is going to pray. The Ka’bah is in the sacred masjid of Makkah in Saudi Arabi. Facing towards Qiblah (Ka’bah) is a very important condition of performance of prayer. After facing the Qiblah the person should make niyyah (intention). The intention is made within his mind, so the person should think about the particular obligatory, optional or nafl prayer he intends to perform. After making Niyyah the person should start his prayer saying “Allahu Akbar” (Allah is the greatest) raising both of his hands to the shoulders, with fingers stretching to the ear lobes. (For Hanafis, the thumbs should rub against the ear lobes). He should then fold his hands in between his chest and navel (Shafi’i) or on the navel (Hanafi) with his right hand over the left hand. This time “Allahu Akbar” is called Takbir Tahrimah because after saying Takbir Tahrimah every common and worldly action, talk or movement is forbidden. 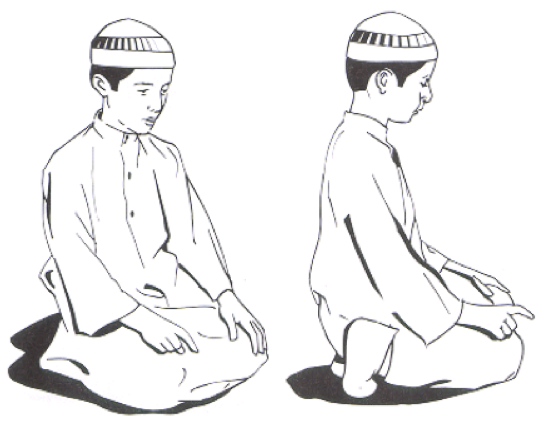 Throughout the prayer the eyes of the worshiper should point to the spot where the forehead rests in Sajdah. اللَّهُمَّ باعِدْ بَيْني وَ بَيْنَ خَطايايَ كَما باعَدْتَ بَيْنَ المَشْرِقِ وَ المَغْرَبِ، اللَّهُمَّ نَقِّني مِن خَطايايَ كَما يُنَقّى الثَّوْبُ الأَبْيَضُ مِنَ الدَّنَسِ، اللَّهُمَّ اغْسِلْني مِن خَطايايَ بِالماءِ وَ الثَّلْجِ وَ البَرَدِ. الْحَمْدُ للهِ رَبِّ الْعالَمينَ۞ الرَّحْمنِ الرَّحيمِ۞ مالِكِ يَوْمَ الدّينِ۞ إِيّاكَ نَعْبُدُ وَ إِيّاكَ نَسْتَعينَ۞ اِهْدِنا الصِّراطَ الْمُسْتَقيمَ۞ صِراطَ الَّذيْنَ أَنْعَمْتَ عَلَيْهِمْ غَيْرِ الْمَغْضوبِ عَلَيْهِمْ وَ لا الضَّآلِّينَ۞ آمين. Reciting A-Fatihah is so important that Prophet Muhammad (Sallallaahu Alaihi WaSallam) said that no prayer was acceptable wi1thout the recitation of Al-Fatihah. It is sunnah to say Ameen when a person finishes recitation of Surah Al-Fatihah. If he is praying alone he should say “Ameen” in silence and if he is praying with congregation behind an Imam then he should say Ameen fairly loudly when the Imam finishes saying the last verse of Surah Al-Fatihah. When saying Ameen the voice of the whole congregation should resound at the same time. It is sunnah for a person who is praying that he should read a surah from Quran after Al-Fatihah in the first two rak’ats of the fard prayer. Here are a few short Surahs which you can recite. Then the person praying should say “Allahu Akbar” raising both his hands to shoulder level with the palms facing outwards and fingers stretching to earlobes. He should then bend in ruku’ so that his trunk (i.e. from head to hips) is perpendicular to the rest of the body. His hands should rest on his knees with the fingers spread apart, taking care that his arms do not touch his body. The person should be calm and composed in the ruku’ posture and not hurry it. Then the companions asked, “How can someone steal from his prayer?” Prophet (Sallallaahu Alaihi WaSallam) answered, “He does complete his Ruku’ and Sajdah with perfection.” (Ahmad, Tabrani, Ibn Khuzaimah, Hakim). These hadiths prove that Ruku’ and Sajdah should be done calmly, slowly and perfectly. Otherwise the salaah of the person will be deficient. This means, “Verily Allah listens toone who praises him.” One should raise the hands up to the level of his shoulders with palms facing outwards and fingers stretched to the earlobes and then he should lower his hands to his sides. In the standing position he should be erect so that the jointsof his body go hack in place. Then the person should perform the second sajdah saying, “Allahu Akbar” and repeat what he did in the first sajdah. Then he should raise his head up saying. “Allahu Akbar” and sit for a short while as he did in jalsah. He does this before standing up for the second rak’at. 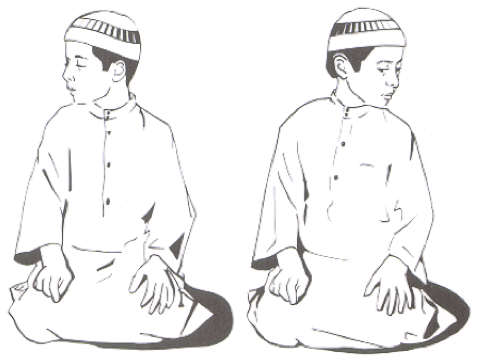 After standing up for the second rak’at he should fold his hands over his chest as he did in the first rak’at and start his recitation by reading “Basmalah and Surah-Fatihah followed by any passage or a chapter of the Holy Quran.” Then he should complete his second rak’at in the manner of the first one. While choosing a passage or a chapter for the recitation in the second or a subsequent rak’at the worshipper should observe the order in which they occur in the Holy Quran. Also, each Surah or verse should be shorter than the one recited before it. Hence, longer surahs are recited before shorter surahs. After completing the last sajdah of the second rak’at, the person should raise his head saying: “Allah Akbar”. 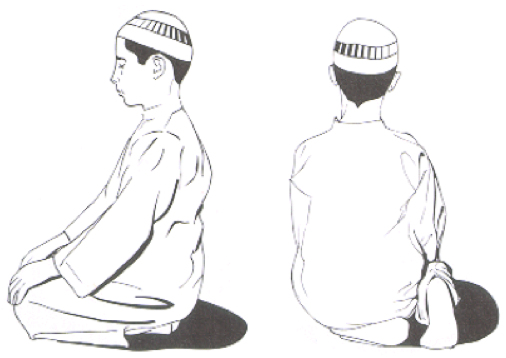 He should sit as he sat between the two sajdah, putting his left hand on his left knee and right hand on his right knee. The fist of the right hand is closed except for the index finger which is protruded. While reading “Ash hadu ……’abduhu wa rasuluh.” A person should raise the index finger of his right hand slightly and return it to its previous position after he has finished saying it. A person praying 2 rak’ats only should end with salaah with Salawat Ibrahimiyyah. If a person is praying three or four rak’ats, then he should stand up after tashahud saying “Allahu Akbar” and raising his hands as he did in Takbir Tahrimah start his recitation with of Basmalah, Surah Al-Fatihah and then a short Surah. Peace be on you and the mercy of Allah,” turning the face first to the right and then to the left, both times over the shoulder. This brings the two, three or four rak’ats of the prayer to completion. this work is absolute amazing, very good by all means. for the duaas if you can add the reference for all peoples benifit, its would be fantastic.